Thank you so much for purchasing from Kari Johnson Art! Please allow 3-5 business days for processing. Paintings and prints are shipped once a week, most likely Tuesdays. If you require something quicker, please email hello@karijohnsonart.com. Unframed artwork ships via USPS Priority or UPS, fully insured with tracking. All works on paper are sealed in plastic sleeves and sent in rigid mailers or tubes. We do our best to securely package all artwork for shipping. Framed artwork will arrive 2-3 weeks after your order, directly from Simply Framed once they have completed the framing. All sales are final. Exceptions are only made when damaged during shipping. It is important that you immediately inspect your order when it arrives. 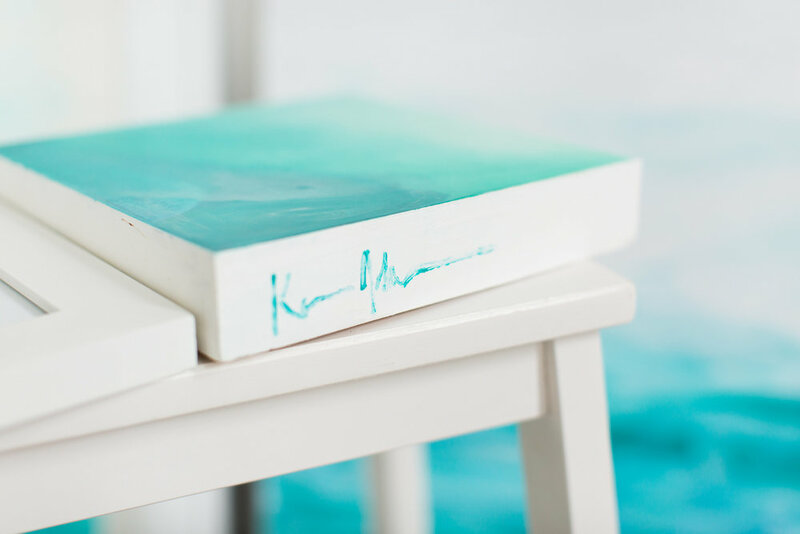 If your artwork is damaged or lost during shipping please email Kari at hello@karijohnsonart.com. We will do our best to remedy the situation. By visiting karijohnsonart.com, you are consenting to our terms and conditions. E-commerce: We offer products/services for sale on this site using Squarespace Commerce. To avoid learning your credit card information, we’ve partnered with STRIPE to securely process payment. As such, we never learn or store your credit card information. They share your name and mailing address so we can complete the transaction. This site contains intellectual property owned by Kari Johnson and Rachel Zee Photography, including trademarks, copyrights, and other intellectual property. However, we want you to share our content please do so by crediting Kari Johnson Art. If you are interested in additional marketing opportunities please email hello@karijohnsonart.com. Artwork may not be resold or reproduced without my expressed written permission. 1. The information that you manually provide us by filing out our contact form, signing our email list or making a purchase from the shop. This information can be tied directly to you because of the information you’ve provided. We do our best to protect your sensitive personal information. We protect it by partnering with Stripe to process and store your credit card information. We collect this information so we can better serve your needs and give you products you love. The information collected is only shared with our trusted third-party partners and only when necessary to serve you. If you would like to know what information we have that’s directly attributable to you, email us at hello@karijohnsonart.com. Changes: These terms were last updated May 23, 2018.